WordPress Platform is always recommended by most of the probloggers due to ease and other powerful factors.However some of the wordPress users who has installed the latest updates are complaining that they are not able to upload image files.Most of them has reported that they get an error message “An Error Occurred In The Upload.Please Try Again Later” when trying to upload pictures for Featured Post.If you are also facing this issue then i have few working solution for you. 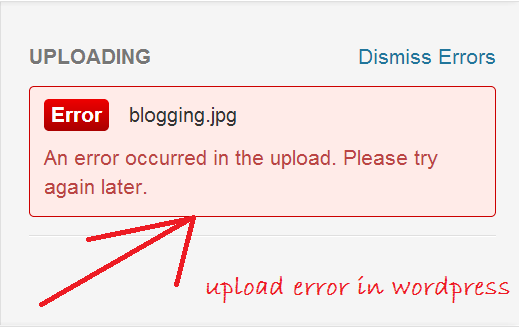 This error normally is an issue with wordPress 3.5.1.Let’s check the below given points for the solution. What is the Reason behind the Occurance of this Error? After checking the issues and solution posted by so many users of wordPress,it seems that the cause of an upload error “An Error Occurred In The Upload.Please Try Again Later” is the result of a Particular plugin conflict.It means that you can easily fix this issue.However if this is not related to any plugin conflict then it is a serious issue for you. I have Four working method for you so try these method and check whether it fix your issue or not? As i mentioned earlier,it can be due to the Plugin conflict.To check whether it is actually the case,disable all of your plugin by navigating to WordPress Admin Dashboard > Plugins > Select All Plugins > Bulk Action > Disable > Go. Now refresh your Post and Try to Upload the Picture again.If you are not getting any error then activate each of your plugin one by one to find the culprit. If you have found the Problematic plugin then remove it.It will fix your issue. Sometimes,Plugin leaves their effect even after the deactivation so if the above method failed to work for you,try to remove all of them. To do so,navigate to WordPress Admin Dashboard > Plugins > Deactivated > Select All > Bulk Actions > Delete > Go. Now check whether it works for you or not.If it worked for you then reinstall your plugin one by one again and enjoy. If both of the Above method failed to work for you then you should try to Re-install your WordPress software again.Make sure that you are following the below given procedure for doing so because i am not saying to remove your blog.I am just suggesting you to reinstall it. Log into your CPanel,open Files and navigate to the root directory of your WordPress Blog. What to do if all of the Above Method fails? If none of the above method worked for you then i will recommend you to downgrade your WordPress version.If you don’t know the procedure to downgrade the wordpress version then wait for our next post.In my next post,i will show you how to downgrade the WordPress version. So many WordPress users are complaining about this error.I have just tried to help you by bringing a solution for you.So just try the above steps and check whether it fix “An Error Occurred In The Upload.Please Try Again Later” error. If you are still facing any issue or have any solution for this issue then feel free to inform us through comments.It would be a pleasure for me to add your suggestions and solution to our post.